Ah,that elusive perfection! 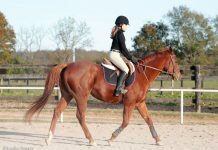 Hunter and jumper riders spend years perfecting their position in the saddle, acknowledging the links between form and function and between a visually appealing picture and an effective ride. But what is the less than perfect rider to do? How can stubborn bad habits be conquered? Professional trainer, instructor and United States Equestrian Federation “R” judge Julie Winkel offered her insights from Indio, Calif., the winter quarters for her farm, Maplewood Inc. The rest of the year she trains and teaches from her home base in Reno, Nev. Judging since 1984, Julie has officiated at some of America’s major horse shows, such as Devon, Harrisburg, the Hampton Classic and Upperville. Here are three less than perfect positions Julie frequently observes, and how she recommends improving them. A strong, quiet leg allows you to remain in balance with your horse while a loose lower leg makes for an insecure seat in the saddle. The flaw is more exaggerated when jumping. Because a loose, swinging lower leg cannot communicate with the horse, you’ll rely on your hands to do most of the work. Typically, you will perch atop your horse by clenching with your thighs and pivoting on your knee. At the moment of takeoff, your heels come up, and your lower leg swings far behind the girth. Bereft of your lower leg, your source of balance is in your hands, which are either planted on the horse’s neck or gripping firmly to the reins. Julie prescribes the following exercise to remedy the less than perfect leg. By using an open rein (sometimes called a leading rein) for controlled turns over two low jumps, you learn that you can’t use your hands as a crutch. Without the artificial security, you must keep your lower leg in its proper place to maintain your balance, or you’ll fall forward. By being forced to use an open rein, where the hand is held away from the horse’s neck, you must maintain a correct leg position or you’ll teeter awkwardly. To practice this, Julie says to set two cross-rails placed relative to each other at slightly more than a 90-degree angle (picture the hands of a clock at 8:00). Approach the first cross-rail in a straight line at the trot, keeping the horse ahead of your leg and wait for a quiet take-off distance. Don’t anticipate the jump by getting ahead of the motion. As the horse leaves the ground, concentrate on pushing down into your heels while using an inside open rein to turn the horse to the left toward the next cross-rail. Then approach the second jump in the same manner as the first. This time, however, use a right open rein to roll back to the first jump, completing a figure-eight pattern. Besides learning not to rush the jumping effort, you’ll begin to get a feel for what it’s like to take away the horse’s neck as a balance beam. Today’s hectic pace of life forces many equestrians to schedule ride time after business hours. By the end of a long day at the office, some riders might lack the physical fortitude to sit tall in the saddle. But when it becomes a habit, sloppy posture ruins a rider’s appearance and thwarts an effective performance. According to Julie, a rounded back and slouched shoulders are usually linked to a rider’s downward gaze. By looking down (often at the horse), the rider’s shoulders correspondingly roll forward. Then the back softens and becomes rounded like a turtle’s shell. The general impression is that of a weak rider hovering over the horse’s back, forever ahead of the horse’s motion. “Again, riding ahead of the motion is never a safe place to be,” Julie says. If a horse should take a misstep or suddenly refuse a jump, inertia will catapult the rider out of the saddle. “It can also cause a horse to land heavy on his front end,” she adds. That can cost a rail when the horse drops a hind leg, and it could also cause a fateful stumble. “Exercises that involve eye control will help correct this position flaw,” Julie explains. She recommends a series of bounces (jumps with less than a full stride in between), concentrating on a focal point, which will help you stay in the proper position. With eyes focused on a distant object in line with the series of jumps, your posture improves. There should be a definite focal point at the end of the grid. Your instructor, a cone or a landmark will serve to keep your eyes up rather than staring down at your horse or the jumps. Due to the measurements between the jumps, the horse will feel as if he’s bouncing over the obstacles. This will encourage you to maintain the proper upper body posture and keep you from bouncing out of the saddle. Most hunt-seat judges have a score sheet icon to denote what’s euphemistically referred to as “the chair seat.” This position flaw resembles precisely what the term implies: You look as if you’re sitting in a chair rather than a saddle. Despite the bolt upright posture, your weight is entirely on your seat bones, your thighs approach the horizontal, and your feet are thrust ahead of the girth. The chair seat is, in some ways, the opposite of riding ahead of the horse. Here, you are perpetually behind the motion of the horse, forever pushing the horse forward and faster. Although trotting through cavalletti seems simple, it’s a difficult assignment for someone struggling to climb out of the chair seat. Often your first impulse is to plop down into the saddle and “bump” with the seat in an effort to help your horse over the cavalletti. Only when it becomes second nature to ride with the motion of your horse should you continue on to cantering courses. It may take a while, but with the guidance of a patient instructor, practice does fix the less than perfect position. 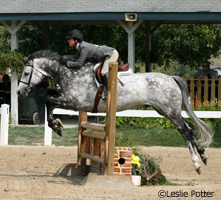 Learn correct seats for riding hunters and jumpers. Fix your hand position faults. This was a great article! Thanks for the tips! I haven’t started jumping yet but this I’ll keep in mind. Thanks! Good article. I am saving it, so i can read it again later. great article- but what about jumping ahead of the vertical?